There is a Maine camp for every child. Whether your child chooses a traditional residential camp, a sports or arts camp, a trip or technology camp, the experience will be transformative. Camps offer community and friendships, unstructured play, they foster independence, confidence, and relationships with role models whose influence can be life-long. Your child will learn to take initiative and learn to lead. By immersing kids in the state’s vast natural beauty, camps instill a sense of environmental stewardship. 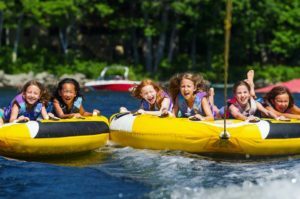 Families have chosen Maine camps for more than a century and into today’s high-stress, high-tech world, camps continue to be a haven. Learn how you and your child can take advantage of all Maine and its camps have to offer with our Find-A-Camp tool.